Canadian stocks took a conspicuous downward turn as news broke of a shooting on Parliament Hill in Ottawa. The S&P TSX Composite, like the New York indices, was trading mostly sideways this morning until about 10 a.m., when the first reports began coming out about gunshots fired at the War Memorial and on Parliament Hill in Ottawa. At that point, New York and Toronto diverged, with Toronto going into a dive. S&P TSX in red, Dow Jones Industrial Average in blue. The S&P TSX was down 172 points, or about 1.2 per cent, just before 2 p.m ET. To be sure, there was enough bad economic news out today to have spooked the markets even without a shooting in Parliament. The Bank of Canada, in its latest interest rate announcement, expressed concern about house prices in “major cities” in Ontario, Alberta and B.C. — presumably referring to the particularly heated housing markets in Toronto, Vancouver and Calgary. It said “financial stability risks” had increased since its last review in the summer, due to rising debt levels, though it kept its key lending rate at one per cent, for the 33rd interest rate decision in a row (it hasn't changed since September, 2010). And retail sales came in below expectations, falling 0.3 per cent to $42.4 billion in August, according to StatsCan. That’s the second month in a row retail sales fell. Some analysts said it wasn't the shooting or the bad economic news that sent stocks tumbling — it was just profit-taking after four days of solid market gains. 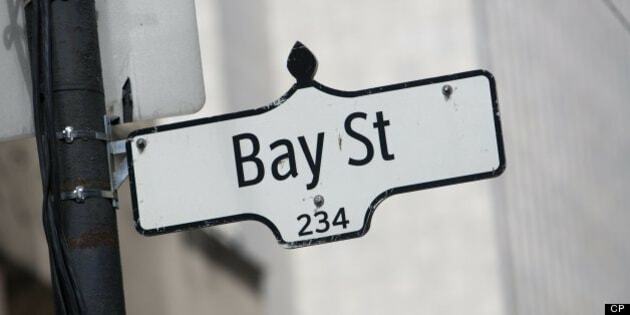 "The [market] was trading down at the open, it was already in that trend, so the decline was to be expected," Michael Greenberg, portfolio manager at Franklin Templeton Solutions Group, told The Canadian Press. All the same, the chart above shows the TSX moving into a steeper decline around 10 a.m., about the time reports of the shooting came out. And U.S. markets did not follow the Canadian move. So it certainly looks like a day of fear, not just in Ottawa, but on Bay Street too.